Woolworths started stocking 'Milo Champions Band' activity Tracker pack (includes a Fitbit style watch/tracker and a 450g tin of Milo) for $39.99 a few weeks ago, around the time that I bought my cheap activity tracker from Aldi for $37. The Milo tracker actually looks a bit better than mine, as it is similar to a Fitbit Charge (having an OLED display to display the time, step count, calories etc.) whereas mine is more like a Fitbit Flex and only has a row of five LED dots to indicate the mode, or your progress towards the daily stepcount target. I had thought about getting one of the Milo trackers for myself, but the band is much too small, I prefer a shirt clip instead of a wrist band, and the Milo App is geared towards children aged 6-12. DS2 was very keen to get a Milo Champions Band when he first saw it, but I told him we'd wait and see if the price came down a bit. After two weeks Woolies still had a shelf full of unsold Milo Champions Bands, and the price was lowered to $35 last week, and then to $29.99 yesterday. I decided to buy one for DS2 as a reward for getting an 'A' in his recent AMEB Grade 1 piano exam, and he tried it out last night and was very keen to wear it to school today. We downloaded the Milo Champions App this morning and managed to get it 'paired' to the device (which automatically set it to the correct time), and I setup a child account for DS2 with his age, gender, height and weight details. It didn't seem to automatically download the step count data from yesterday, so I'll have to play around with getting it to 'sync' tonight. 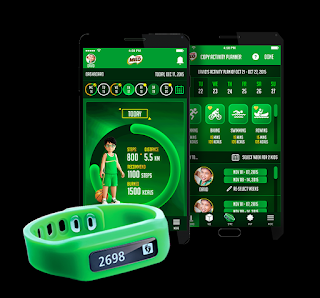 So far the Milo Band and the app seem to be good quality and excellent value. The school teacher usually doesn't let kids wear watches in class (the kids apparently find looking at the time more entertaining that the lesson! ), so I wrote a permission note for DS2 to wear his Milo band during class time (as long as he doesn't look at it), as he might lose it if he has to take it off and on several times each school day (the band latches on very securely when done up properly, but the studs are a little bit difficult to press fully in). Hopefully the Milo Band will encourage DS2 to come along with me for my evening walk each day, as he will need to get used to long walks if he is going to complete the City2Surf (walking) with me in August. If Woolworths doesn't sell too many of the devices at the currently reduced price they might cut prices even further - in which case I'll probably buy another one for DS1 if it only costs $20 or so.